On November 28, Ms. Liu Guifang, the coach at the Tai Chi class at Confucius Institute at Alfred University, was invited to for a Tai Wai demonstration at the Wellsville Public Library, which attracted a large number of members and visitors. This is the fourth time that Master Liu Guifang has been invited by the community in Wellsville. In the David A Howe Public Library, she led more than 30 members to practice Chinese Kung Fu, such as "Baduanjin", "Mawangdui Daoyin" and "Taiyi Swimming Dragon" together with local residents. 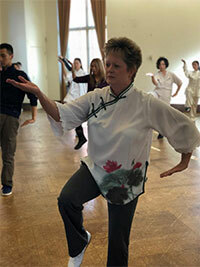 Ms. Theresa Brown, a member of the Tai Chi class at the Confucius Institute at Alfred University, has been learning tai chi for six years and is now a tai chi instructor in Wellsville. She said: "Practicing tai chi has helped me to better focus and calm myself, and an hour&apos;s practice every morning can keep me feeling good for the whole day. "She also emphasized the purpose of the event is to "enable more community residents to understand the benefits of Tai Chi and welcome them to join us." Master Liu Guifang is a member of China Wushu Association, level six martial art master, and national-level Judge. She has been teaching tai chi including Tai Chi Chuan, Swimming Dragon, and Qigong at Confucius Institute at Alfred University since 2010. More than 100 people from Alfred University and its surrounding communities have attended Tai Chi classes. In January of this year, Master Liu Guifang won the 2017 "Most Dedicated Award" in Alfred. This Tai Chi demonstration brought more local community residents to Tai Chi and they became interested in Tai Chi Class by Confucius Institute at Alfred University. Ms. Kathryn Ross, a reporter for Wellsville Daily Reporter, a local newspaper, interviewed Liu Guifang and Theresa after class and gave an in-depth coverage of the presentation. When asked why he wanted to teach Tai Chi for free, Master Liu Guifang said: "Tai Chi originates from China and belongs to the world. It is borderless and everyone can benefit from it." "A Sense of Han" Contemporary Wash and Ink International Invitational Exhibition organized by Confucius Institute at Alfred University and hosted by China-US Culture and Art Exchange Center (CUCA) was opened in the International Exhibition Hall of UNESCO New York Association. Artists from China and the US attended the opening Ceremony, Yongji Xu, Educational Counselor of the Chinese Consulate in New York, and Li Li, Cultural Counselor of the Chinese Consulate in New York, sent their congratulations to the opening of the exhibition. 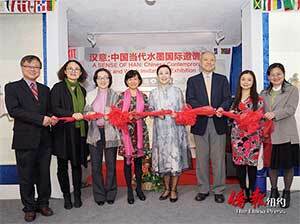 Ms. Yiling Li, chairman of the UNESCO New York Association, presided over the opening ceremony of the exhibition. Professor Wilfred Huang, the American Director of the Confucius Institute at Alfred University, delivered an opening speech at this exhibition: "Confucius Institute at Alfred University has been promoting Chinese language and culture since its establishment nine years ago. In order to offer an exchange platform between institution in the US and in China, we Confucius Institute held a Sino-American art institution exchange and discussion seminar, this year&apos;s exhibition is one of the outcomes of the seminar. Associate Professor Zhongbei Wu, associate Director of the Confucius Institute at Alfred University, is one of the curators of this exhibition. She introduced the works and artists of the exhibition to the guests. She said: "Chinese wash and ink painting carries a long history of Chinese painting aesthetic tradition, which is a business card presented to the world by Chinese painting in the contemporary era. The theme of the exhibition covers figures and landscapes. The artists participating in the exhibition are Qianru Zhong, Xinyao Wang, Bin Luo, Chunbing Liu, Wei Shen, Jun Ye, Changxue Pan, Li Wang, Shan Ding, Hao Zhou, Guoqiang Su, and Zifeng Chen, they are the most representative cutting-edge artists in Central China." Associate Professor Wu Zhongbei introduces: "The works in this exhibition do not focus on expressing the excitement and hustle and bustle of contemporary visual art, but rather the quiet image the artist sought from traditional culture, so the theme of the exhibition is &apos;A Sense of Han &apos;". Associate Professor Jijun Yu, the Chinese Director of Confucius Institute at Alfred University, extended a warm welcome to all guests and introduced the guests who attended the opening ceremony: Professor Wenqin Wang, Chinese Director of Confucius Institute at Pace University, Professor Xiaoxia Zhou, Chinese Director of Confucius Institute at China Institute in America, Professor Jie Chen, Chinese Director of Confucius Institute at SUNY College of Optometry, Professor Jie Yao, Chinese Director of Confucius Institute for Business at SUNY and Ms. Jiahan Zhang, famous Chinese singer, and Chinese pianist Mr. Jiajun Hong. The guests all expressed their congratulation on the opening of the exhibition and exchanged the experiences in promoting Chinese art and culture in the United States. Subsequently, the organizers and guests cut the ribbon for the opening of the exhibition together. After visiting the exhibition, an Indian-American student named Amin said: "I have studied Chinese for 5 years because I particularly love China. I am very pleased to visit such a high-leveled Chinese art exhibition today and sincerely admire these artists. I hope I can have the opportunity to go to China to learn wash and ink painting in the future." 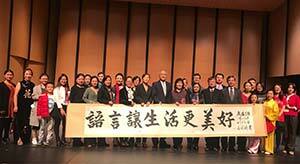 On November 3rd, the opening ceremony of the International Calligraphy Exhibition by Mr. Guodong Li, an internationally renowned calligrapher, was held at Alfred University. As the first stop of the tour, Alfred University will hold the calligraphy exhibition by Mr. Guodong Li at Herrick Memorial Library for one month since November. 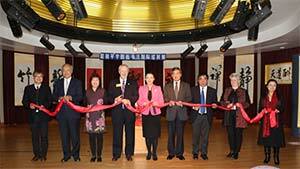 The ribbon-cutting ceremony for this exhibition was held at Knight Club at Alfred University. Important guests attending the ceremony include: Ambassador Qiyue Zhang, Consul General of China in New York; Mr. Yongji Xu, Educational Counselor of China in New York; Yiling Li, president of UNESCO New York Association; Professor Xulong Lai, Vice President of China University of Geosciences (Wuhan); Trina Smith Newton, Superintendent of Geneva City School District; Dr. Rick Stephen, provost of Alfred University; Professor Wilfred Huang, American director of Confucius Institute at Alfred University; and associate Professor Jijun Yu, Chinese Director of the Confucius Institute at Alfred University. Ambassador Qiyue Zhang spoke highly of this calligraphy exhibition. Professor Wilfred Huang, American director of Confucius Institute at Alfred University, gave a warm opening greeting to everyone, and he introduced the calligraphy achievements of Mr. Guodong Li. He said: "Mr. Guodong Li started practicing calligraphy with great concentration since he was six, which was 65 years ago. He has won many international awards and titles. His works have been collected by many celebrities and organizations and presented to many government officials as precious gifts, they are loved and praised by collectors both at home and abroad." At the same time, Professor Wilfred Huang also said: "Since its establishment, Confucius Institute at Alfred University has devoted itself to promoting Chinese traditional culture for nearly ten years. While Mr. Guodong Li is also a calligraphy messenger for friendship and a leader in promoting Chinese culture throughout the world. I hope we can continue to introduce Chinese culture to the world together." Ms. Yiling Li, president of UNESCO New York Association, made a brief introduction of the meaning, image, cultural meaning of Mr. Guodong Li&apos;s calligraphy and the purpose of this exhibition. She said: "Voice couldn&apos;t be conveyed through time and space; thus, word was born. Word is the track of meaning and voice. Calligraphy is the writing art of Chinese characters, which is not only a cultural gem of the Chinese nation, but also unique in the world&apos;s cultural and artistic treasure trove. The calligraphy of Mr. Guodong Li combines the characteristics of cursive script and regular script, which is elegant, unconventional, and powerful, possessing a unique style of his own. Through his exchange by calligraphy, Mr. Li has made great contribution to promoting peace, understanding and friendship, I am delighted to share the calligraphy of Mr. Guodong Li as well as the feast of Chinese culture with people around the world." To correspond with the theme of National Conference on K-12 Chinese Immersion Programs held by Confucius Institute at Alfred University on November 3rd, Mr. Guodong Li specially wrote the theme "Language makes life better" for the conference. And on the concert of the conference, his calligraphy works were presented with dancing in the performance Rhyme of the Ink, demonstrating the unique charm of Chinese calligraphy in front of more than 600 audiences. 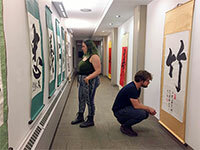 After seeing the calligraphy exhibition by Mr. Guodong Li, Jessica, a junior student majoring in foreign literature, said: "I can feel the incredible sense of strength, rhythm and stereo perception from these dots and lines, Chinese calligraphy is truly marvelous." Mr. Stephen S. Crandall, Dean of Libraries at Alfred University, said: "The library exists as an institution for preserving the cultural wealth of all ethnic groups. I am very pleased that our library is able to serve as the first stop for this calligraphy exhibition by Mr. Guodong Li. These calligraphy works not only convey the Chinese culture to the teachers and students of Alfred University, but also enrich the cultural value of Library in Alfred University." 7:30 p.m. EST, November 3rd, 2017, Legend of Silk, the closing ceremony of the National Conference on K-12 Chinese Immersion Program hosted by Confucius Institute at Alfred University, was a complete success at the Miller Theater of Alfred University. At the beginning of the evening, Dr. Rick Stephen, provost of Alfred University, gave a welcome speech and introduced the guests of the evening, Ambassador Qiyue Zhang, Consul General of the Consulate General of China in New York; Mr. Yongji Xu, Educational Counselor of the Consulate General of China in New York; Mr. Yang Zhang, Consul of the Consulate General of China in New York; Professor Xulong Lai, Vice President of China University of Geosciences (Wuhan); Yiling Li, president of UNESCO New York Association; Professor Wilfred Huang, Director of the Confucius Institute at Alfred University; Associate Professor Jijun Yu, Chinese Director of the Confucius Institute at Alfred University. and nearly 100 experts, scholars and teachers of Chinese immersive teaching from all over the States. Miller Theatre was packed that night, more than 600 people including teachers and students from Alfred University and local residents shared the feast of Chinese culture. Zhongbei Wu, director of the concert and Associate Director of Confucius Institute at Alfred University, said: Since 2010, Confucius Institute at Alfred University has been cooperating with the Division of Performing Arts at Alfred University in offering Chinese music and guzheng courses that are widely welcomed by students. Since then, the Division of Performing Arts has held magnificent Chinese concert every year with Confucius Institute at Alfred University. 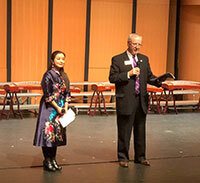 Chinese concert has become an important window for introducing Chinese arts and culture to Alfred University and local residents. The theme of the concert is &apos;Language Makes Life Better&apos; as it&apos;s the closing ceremony of National Conference on K-12 Chinese Immersion Programs. We hope that this concert can show the achievements of Chinese teaching of Confucius Institute at Alfred University through performing arts of China, and show the support of Alfred University to Confucius Institute, the love of students to Chinese, and the community residents&apos; enthusiasm for Chinese culture. The concert lineup was ambitious: AU Chorus from the division of performing arts, Dance Company, Guzheng Ensemble, Dance Company from China University of Geosciences, the cooperative university of Confucius Institute at Alfred University, AU students from Chinese class, Tai Chi Group, students from Chinese classes in different school districts, etc. Nearly 150 performers took part in the concert. The opening of the concert was Lion and Dragon Dance by AU students from Chinese class. The wonderful performance of American students aroused audience’s constant applauses and exclamations. The highlight of the concert was a group of more than 30 students of Chinese immersion classes from kindergarten to third grade at the Geneva School District in New York. Parents of those students excitedly brought their children to AU after two hours driving. The singing and dancing of kids amused all the audiences. Afterwards, Mengwei Zhu, a Chinese teacher from Confucius Institute at Alfred University, performed simulated teaching, "What's your name?" "How old are you?" "What color is this?" Each question was presented to the students. The audience responded to each answer with thunderous applause. "What do we sing next?" "We sing the Ode to the Goose." After the last question was answered, the children sang and danced the Ode to the Goose with the music. Mengwei Zhu said: "We are very happy to see that our children are doing very well on stage. We are looking forward to the greater achievements of Chinese immersion in the future." Since its establishment in 2012, the project cooperated by Confucius Institute at Alfred University and Geneva City School District has continued for five years. Nearly 450 Chinese students from Kindergarten to Grade Five in the Chinese programs at North Street and West Street Elementary School have benefited. In September 2014, the Geneva School District started immersive Chinese classes in kindergarten. Currently, nearly 75 students from kindergarten to third grade participate in Chinese immersion classes. AU students from Guzheng class also brought their wonderful performances. AU Guzheng Ensemble performed "Swordsman" that reflects the heroic spirit and freedom of Chinese martial arts. AU student Charles Miller, who won the gold medal at the 2016 New York Chinese Instrumental Competition, performed "High Mountain and Flowing Water", an award-winning track that won the appreciation of both Chinese and American audiences. The solo of professor Zhongbei Wu, the founder of AU Guzheng Ensemble, "Fighting the Typhoon" more vividly demonstrates the magnificent heroism of Chinese music and culture. In addition to performing in various parts of the United States and touring China in 2014, the AU Guzheng Ensemble was also invited to a reception hosted by the Consulate General of China in New York in November 2016, and the theme of the reception was "Humanities Exchange and Mutual Trust Bridge". Audiences who like Chinese Wushu can find the essence of Kung Fu in "Swimming Dragon". 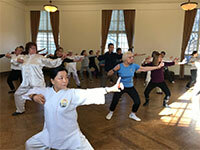 Guifang Liu, the instructor of Tai Chi, and her students brought Tai Chi performance to the audiences. Liz Cronin has been suffering from Amyotrophic Lateral Sclerosis for more than 20 years. 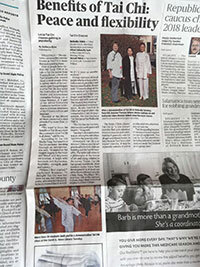 In 2012, she magically felt her feet again after practicing six months in AU's Tai Chi group. Since then she has been practicing Tai Chi every morning. She said, "Tai Chi gave me a new life and made my body stronger and stronger." The Tai Chi Group of Alfred University was founded in 2011, it has now developed into a group of more than one hundred members. Together with Guifang Liu, the Tai Chi group has performed in many cultural activities and is praised by local media as a window for people to understand Chinese culture. In August, 2016, the Tai Chi group went to Beijing to participate in the Swimming Dragon Exchange Conference. They won a group performance award, five individual performance awards, and four outstanding paper awards. "How long will the full moon appear, wine cup in hand, I ask the sky..." AU Students from Chinese class recited the "Prelude to the Water Melody" by Su Shi, a poet in China&apos;s Song Dynasty, and it was accompanied by the "Spring River Moonlit Night" of Guzheng, erhu, pipa and bamboo flute. When the Chinese melody of "Forbidden City" started, Chinese and American models dressed in cheongsam with calligraphy in hands came gently. The calligraphies in the show were provided by the famous calligrapher Guodong Li, and the show was choreographed by Ms. Yiling Li. Through the combination of calligraphy and dance, the audience felt the unique charisma of Chinese calligraphy. The climax of the concert was three Chinese songs, Heaven’s Road, Pastoral Song, and the Youth Dance, by AU Chorus. The AU Chorus has traveled to China for music and culture exchanges in 2014 with the support of the Confucius Institute at Alfred University. The chorus&apos; interpretation of Chinese songs fully demonstrates their understanding of Chinese music and expounds on the characteristics and charm of the multiculturalism between China and the United States to the audiences. Accompanied by Zhongbei Wu with Guzheng, Luanne Crosby, professor at the division of performing arts, sang "the Flowing River", a famous Chinese song. The combination of west and east was elegant and appealing. Yuxiao Chen, a volunteer Chinese teacher from Confucius Institute of Chinese Opera at Binghamton University, performed the Flying Partridge with flute, which was delicate and rhythmical. Ambush from All Sides by Wenwen Chen was powerful and sonorous. Dragon Boat Tune by the dance company from China University of Geosciences reflected the humor and wildness of teenager from Tujia, a minority of China. Their performances fully demonstrated the profound culture of China and the pursuit of world peace. The audience has enjoyed a feast of Chinese culture. Their wonderful performances amazed the audiences. Applauses and cheers came from the audience area constantly. "Unforgettable" "Touched" "Wonderful" "Shocked" ... these words became the key words that night. Ambassador Qiyue Zhang, Consul General of the Consulate General of China in New York, praised the performance, "I know you are doing well, but I didn&apos;t expect that you can be this good. Thank you very much for all your efforts in promoting Chinese culture." Aranda, a retired American professor, said: "This concert is very exciting and I just texted one of my Chinese friend Bob to tell him that through this show I feel the beauty of Chinese culture more and miss him more that I&apos;m longing to learn more about Chinese culture from him, it&apos;s really entertaining." You He, a Korean student, said after the concert: "We have been practicing Dragon Dance and poem recitation every week in the past two months in order to present a marvelous show. Although the process was not easy, we are jubilant after the show ended successfully." These comments again echo the essence of the theme "language makes life better". On the morning of November 3rd, the opening ceremony of National Conference on K-12 Chinese Immersion Programs was held in Powell Center of Alfred University, Professor Wilfred Huang, Director of Confucius Institute at Alfred University, and Dr. David Terry, the head of the Education Department at Alfred University, gave the opening remarks. After the opening remarks, seven keynote speakers presented their research findings on Chinese immersive teaching. and the cultivation of reading ability. "Based on the content of the papers, we divided the presenters into three groups, which are teaching group, research group, and classroom practice group," said associate professor Jijun Yu, chairman of the conference. During the discussion of the conference, presenters exchanged their own experiences and research findings on Chinese immersion programs from difference aspects such as the basic theory, content, teaching project, classroom management, the development and sharing of resources, and the development and promotion of programs. On the closing remarks, Mrs. Qiyue Zhang, the Consul General of the Consulate General of China in New York, Professor Xulong Lai, vice president of China University of Geosciences (Wuhan), and Dr. Rick Stephen, provost of Alfred University, gave praises to the work of Confucius Institute of Alfred University, and expressed warm congratulations to the success of the first National Conference on K-12 Chinese Immersion Programs. "We thank all the experts, scholars and teachers for their active participation and support," said Professor Wilfred Huang, Director of the Confucius Institute at Alfred University. "The feedback we received was very positive and we will continue hosting the second session of the National Conference on Chinese Immersion Programs next year." 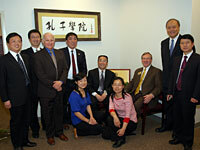 The office of Confucius Institute at Alfred University is officially opened for operations on May 4th. President Charles Edmondson of Alfred University and Vice President Yanxin Wang of China University of Geosciences (Wuhan) together held the ribbon cutting ceremony along with CIAU director Dr. Wilfred V Huang, associate director Carla Coch and instructors Jenny Zhang and Shirley Zhu. The office is located on the second floor of the Olin Building. On May 3rd outside Powell Campus Center, Confucius Institute at Alfred University (CIAU) started its opening day with the traditional Chinese lion dance, which brought guests and students later to the Nevins Theatre for the opening ceremony. CIAU Director Dr. Wilfred V. Huang made the opening speech at the ceremony and President Charles Edmondson of Alfred University delivered a welcoming speech to all the guests present. China University of Geosciences (CUG), the partner institution of Alfred University for CIAU, has also sent its delegation for the opening. After the introduction of the distinguished delegates from China by Dr. Huang, Vice President Yanxin Wang of CUG delivered his speech, confirming the efforts made by both parties to establish the CIAU. He expressed his sincere wishes for the success of CIAU and promised full supports from CUG for further bilateral cooperation in various aspects. The team of CIAU was introduced by Associate Provost Dr. William Hall. They are Director Dr. Wilfred Huang, Associate Director Xinquan Liu, Associate Director Carla Coch, instructor Yuzhen (Jenny) Zhang and Jing (Shirley) Zhu. Later, both presidents signed the executive agreement of managing CIAU together and unveiled the Plate of CIAU. The official signing was followed by traditional Chinese music and dance by professional artists from New York City and New Jersey. Prof. Donald Wayne Higby, the world renowned ceramist who has been working with China for almost 20 years, gave the keynote speech entitled Kong dot Flux. He has beautifully connected Alfred University with China by sharing his own experiences seeing great changes in China. His remarks on the inter-relationship between countries that co-exist with each other need to depend on and cooperate with each other were appraised by the audience. Prof. Higby expressed his heartfelt wishes for the long lived friendship and cooperation between two institutions and the success of CIAU. The opening day also featured an entertainment show in the evening, presenting wonderful traditional Chinese instrument performances (such as Yangqin, Erhu, Pipa and Dizi), traditional Chinese ethnic dances and Chinese acrobatics. A delegation of five administrators/professors from China University of Geosciences (Wuhan) visited Alfred University from May 2nd to May 5th. They are Dr. Yanxin Wang (Vice President), Dr. Xulong Lai (Dean of Earth Science), Dr. Yuanxing Dong (Dean of Foreign Languages), Dr. Bin Shuai (Dean of Communication & Art) and Dr. Hongtao Su (Deputy Dean of International Education). They met with President Charles Edmondson, Provost Suzanne Buckley, academic deans and several directors and chairpersons. CIAU director Dr. Wilfred V. Huang and instructor Jenny Zhang attended the second National Chinese language Conference which took place at the Marriott Downtown Hotel in Chicago. The attendees were invited to visit public schools in Chicago as pre-conference events. All Confucius institutes in America and Canada came together and discussed their goals in the coming 10 years to go along with the strategies set by Hanban. The annual cultural stage show "Alfred to Asia", sponsored by CIAU this year, was held at the Holmes Auditorium, Harder Hall. Two students started the program with Chinese traditional lion dance. The show presented spectacular Chinese performances including traditional Chinese instrument performance - Yangqin (Hammered Dulcimer) and fabulous Chinese dance - Kwanyin with thousand hands. The show also displayed different aspects of Asian culture, including Middle East Dance, traditional Japanese folk dance, Kyrgyzstan and Uzbekistan dance, etc. CIAU is participating in this year's Chinese Bridge Summer Camp. Totally four school districts nominated their students, and fifteen of them were selected and approved by Hanban along with two teachers as chaperones. CIAU has visited the school districts and met with the parents of students with the chaperones. The Summer Camp will take place in Beijing and Jilin from July 14 to July 31, 2009. The program includes learning Chinese language, Chinese culture and sightseeing. There will be 820 students going from United States. The Chinese students and professors at Alfred University gathered together at the Susan Howell Hall to celebrate the 2009 Chinese New Year. Many international students as well as teachers at Alfred University participated in it, bringing some dishes to share. Traditional Chinese food such as dumplings, fried rice, noodles were served and welcomed by all the people. Our keynote speaker Dr. Jinghong Fan, Professor of Mechanical Engineering, introduced the (blessing/good fortune) culture in China and sent his best wishes to everyone present.